Tradition and technology seem to have adjusted very well with each other. One maintains the sanctity of convenience and the other glamourises memories. The Wedding Season calls forth a competition to applaud the one who entertains the loudest. With that much brouhaha, of course the hosts have reason to worry about theft. 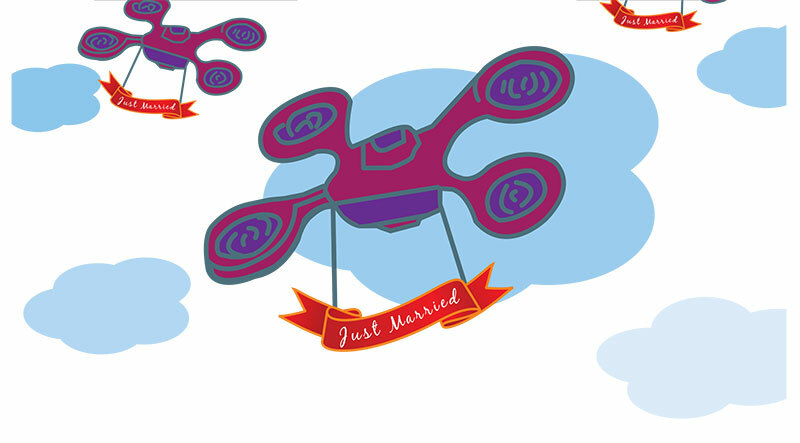 Enter electronic swipe wedding cards. The security chip is inserted on a plastic sheet that can just as easily slip into your tiniest clutch. Reach the venue, and swipe to enter. Technology filters out the hoodlums quite effortlessly, allowing us a celebration to document without unsolicited interruptions. With that out of the way, the new crop of videographers can take their ambitious experiments to the skies. No longer are wedding reels three hours long and filled with clippings of boring. These have gladly been replaced with well-directed films showing only the most beautiful moments shot from the front, back, bottom and even the top. That’s right. Drones are the new chief guests at every function. May the best angle win! Complementing these theatrics, revolving platforms have been on the radar since a while now. As are the little petal blowers. What could be extremely dazzling though is a laser projection of the couple’s initials, in customised designer monograms, on a smoke screen that poses as a curtain through which the couple can tear its way into a grand entry. Voila! You have yourself a fairy-tale moment. Now with the right filters and favourite soundtracks, the film is bound to be akin to those of Bollywood thrills, only, these may entertain for 45 minutes tops, if at all. And let’s not forget social media for there is a trailer version to upload here as well. Speaking of uploading, videographers have yet another treat for us. No more is it necessary to stretch yourself thin to please each and every one of those ageing aunts who insist that your wedding be held at a close and convenient location. There is a live stream option available, which can easily be set up on your big day. And when nine out of 10 aunts crib about the travel, send them a link and you can enjoy your wedding with them away in their bedrooms, viewing it through their laptop screens.